1 Omni Omni 600 $190.2 $70.5 $119.7 in equity; no debt. Remainder is public. Two reports being delivered Tuesday to the Oklahoma City Council advise that the city can support construction of a 735-room conference hotel as part of development of a new convention center. Texas consultant Jeremy Stone's study, compiled though visits with local hoteliers and analysis of local hospitality data, reports five full-service, “competitive” hotels enjoyed average room occupancy of 75.6 percent, with an average daily room rate of $129 in 2012. After consideration of additional limited-service hotels being built or planned in Bricktown and Deep Deuce, Stone's report concludes that a new conference hotel, if it opened with the new convention center in 2019, would hit 56 percent occupancy that first year, jump to 64 percent the next year, and average out at 66 percent occupancy in 2022. That's great news Pete! Does anyone have a number on how many total rooms that would make it for all of downtown? If it would open to 56% occupancy, and average out at 66% three years later, wouldn't that suggest it ought to be closer to a 600 room hotel and run more like 80% on average? Or do hotels not run averages that high and doing so would somehow be a bad thing. - rarely have someone leave a light on for me, fancy or otherwise. Where would the funding for the convention center hotel come from? Bond funds? Probably because they can run at 66% average occupancy but still have the option to fill to 100% for certain weekends and events. Hopefully the hotel operator will be new franchise that is currently not in our market like, Omni, JW Marriott, or W.
It is would open to 56% occupancy, and average out at 66% three years later, wouldn't that suggest it ought to be closer to a 600 room hotel and run more like 80% on average? I know this sounds weird, but the 60 percent is the threshold for what is considered a successful hotel. 80 percent would be considered perpetually full. I am told downtown hotels, all considered, are averaging at 76 percent. If everything gets build that is proposed, we would have almost 4,000 rooms in the downtown area. Can someone fill me in on the graphic at the top of this thread? Is this a new conceptual study of what they might build? I have to say as much as I have not been too thrilled about the location that they keep insisting for this, something of this nature with a great street presence and street level retail on both sides, or even shrouding the building itself with a mix of live work studio, brownstones etc. with carefully designed convention center entrances would be exciting. I realize that the danger is that with such a simplistic form and lacking any context it is enough to let my imagination run wild and hope for the best. This concept allows that to happen, so has my radar going off. Any additional detail would be welcome. Thanks in advance! They have $30 million (money that was first designated to move the OG&E power grid) in a contingency fund? Could some of that be used to lure an anchor hotel as part of the Oklahoma City MAPS III convention center & hotel development? That would be a win-win situation but I doubt it'll go down like that. Probably will be put toward the cost of the convention center itself if actual collections fall under projections. BTW, does anyone know where we're at on MAPS3 collections thus far? Calling LarryOKC. LarryOKC, are you out there? You can post a link to your answer on the proper thread in this thread if you need to! The math and logic behind this whole thing is so screwy it makes my head hurt just to think about it. Alas, it proves one thing, the OKC Chamber are experts at double counting. As for losing out on 100 conventions - I wonder if anyone can name one of them. Not to blend this thread with another popular thread, but I'm guessing that Shadid comes after this project if he gets elected. Of course he probably comes after the streetcar too. So the way this all shook out is that it is a package deal. You gotta take the good with the bad, or you can lose both. Hmmm.... Almost as if the writers of the MAPS3 ballot initiative planned it that way. But...it would be OK if he came after the CC or the CC hotel, as long as he doesn't come after the streetcar, right..? Shadid won't ever get that chance. Cornett is locked-in. I think OKC needs both. It would be great to start getting some high profile conventions here. I could be wrong but I don't think the Cox cuts it. The convention center attached to an Omni or Hyatt hotel would be a huge coup for OKC. 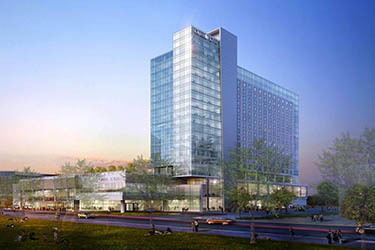 After the completion of the Aloft, downtown will have four full-service hotels. I think it could handle one more. Most of the best hotels in OKC are in the NW Expressway business district, not downtown. I agree with you bchris02. I think OKC needs both. Please don't assume that and stay away from the polls March 4. Better yet, get 5 of your friends to vote as well. Shadid supporters will all be voting and the danger is if Mick supporters think they don't have to, that the race is locked up. This is not a case of The Chicken or The Egg debate. We have to have these (high caliber) facilities before we can attrack larger conventions and additional outside business opportunities in industry shows. These items are a must on the next-level stage for OKC. Convention Center & Hotel. ...and i want 50 stories too. (if not, then lots of eye candy). They should just sell the CC as a quality of life and civic pride project and knock it off with these crazy out of the realm of possibility projections. They are embarrassing themselves. It is okay for the people to have nice things built with public money. They should leave it at that. Constitutional Convention sure why not.